We’ve had plenty of time to get attached to Sheriff’s Deputy Grimes, which is why it’s so hard to silence the fan theory that Rick could be the guy who got Lucilled last season. That would be the best reason to make us wait all summer to find out. Regardless of who it is, Rick Grimes will always be an indelible part of The Walking Dead, and zombie lore in general. One of Rick’s most striking characteristics is the fervent devotion he has to his family. Lori, Carl, and eventually Judith are the most important things in Rick’s life. But for as long as we’ve known him, Rick has placed a special emphasis on his relationship with his son. This comes naturally to many fathers, but sadly not all. In Rick’s case, though, there seems to be a clear connection between Rick’s desire to be a role model for Carl, and Rick’s admiration for his own father. We know from Rick’s conversations with Lori, Hershel Greene, Shane, and Carl that the elder Grimes took Rick fishing, taught him how to hunt, and– like all the best parents– led by example. Rick considered his father to be a strong and steady man, one who retained his morality and personal code in the face of extreme duress. We don’t know exactly what that entailed. It’s easy to guess, though, that Rick’s circumstances were even more dire than those endured by his father. We’ve seen Rick crack up a few times, but he always does his best by Carl. Being a trained law enforcement agent no doubt gave Rick skills that benefit him in this terrifying post-apocalyptic world. There are tactical skills like weapons accuracy and hand-to-hand combat, but Rick also knows how to de-escalate a situation and how to effectively deal with someone dangerous without shooting them. One of the first things to happen to Rick after leaving the hospital is him almost being killed by a little boy wielding a shovel. That’s right, Dwayne Jones (though spelled differently, that’s the same name as the actor who played Ben in Night of the Living Dead) bashes Rick over the head with a shovel, knocking him out. We have to think a few more whacks could have killed him. Later, Carl believes that his father died in the night from his injuries. When Rick wakes up slowly and groggily, Carl prepares to shoot him. It’s not until Rick talks that Carl realizes he’s alive. In Alexandria, Ron Anderson— older brother of the cookie-loving Sam– held a loaded gun on Rick because Rick killed his abusive father. Season two was, according to many fans, the worst season ever of The Walking Dead. (Pause here for spirited debate!) Aside from the disappearance of Sophia, the main character conflict was between Rick and Shane. Thematically, the conflict was between the desire to remain human and humane, and becoming brutal as a means of survival. Shane wanted brutality, which eventually leads to him murdering people. Rick wanted peace, which sometimes put people in danger. The first living people Rick kills on The Walking Dead are Tony and David, who tried to kill him and Hershel in a bar. Next though, was Shane (Jon Bernthal), his best and oldest friend. By killing Shane, Rick essential admits the need for brutality in order to survive. This action leads to a downward spiral for Rick that he doesn’t crawl out of until they’re settled in at the prison. These days, Rick is unafraid of killing to do what needs doing…which might prove his ultimateundoing. Speaking of brutality, Rick’s kill count stands at 36 humans. We’ve stopped counting walker kills, but it’s well over 100. That’s a lot of people. In the beginning, Rick killed only people who were directly trying to harm him or his group. Shane wasn’t just trying to steal his wife and raise his son—he was actively trying to murder Rick when Rick stabbed him in the heart. One could argue that Shane is an even bigger a-hole for making his best friend kill him. That’s really mean. Even when people are a potential threat, like Randall, Rick looks for reasons not to kill them. Or he did back in season two. By season six, Rick has no problem breaking into an unknown compound and indiscriminately murdering strangers as part of an agreement with people he barely knows. Rick is even too murderous for Carol, who was once banished by Rick for killing people. The first season of The Walking Dead was some of the best horror television that’s ever existed. Some have argued that it’s not even horror television—it’s high drama that happens to have zombies in it. In either case, the Darabont-infused episodes will always be unsurpassed for many fans. This is especially true of the episodes featuring Morgan and Dwayne Jones. Before them, zombie fans had never cried before at seeing a zombie in the crosshairs of a long distance rifle. We only see Morgan for a few episodes until he goes away for several seasons. When we finally do see him again in season three—the news is not good. Rick still isn’t back with his family at the end of the pilot episode, but we do see Shane, Lori, and Carl at camp. That means everyone who appeared in “Days Gone By” is dead now except Morgan, Carl, and Rick. Note: Glen Rhee was heard in the pilot, but not seen. He’s also alive… for now. If you watched the first season of Game of Thrones, you’ll recall that Ned Stark (Sean Bean) told Jaime Lannister (Nikolaj Coster-Waldau) that he doesn’t fight in tournaments. When asked why, Ned explains that, “When I fight a man for real, I don’t want him to know what I can do.” Smart, right? We suspect that this is also the logic Rick uses when he tells people he’s right handed. In reality, Rick has been seen using both his right and left hand to shoot, stab, grab things, and gesture. We suspect that he’s at least a little ambidextrous, and keeping that on the down-low just in case. It’s a nice bit of insurance to have up your sleeve. Interestingly, the gene that scientists think is connected to ambidexterity is also linked to schizophrenia. This might explain even more about why Rick spent time answering phantom phones and hallucinating Lori in red evening wear. It’s a hereditary gene, which means Judith or Carl might have it too. It’s no secret to fans of The Walking Dead that Rick’s primary motivation is protecting his people, saving his people, leading his people, and later: gardening. Rick is the first guy to plan a new strategy to keep undesirables out. He’s always the one who goes out looking for someone who didn’t come home—whether it’s a member of his family, someone in the main group, or a kid he barely knows who might need help. Rick is the guy to tell if you want someone found, talked to, or rescued. Problem is, Rick sometimes forgets who he’s leaving behind when he indulges his crave to save. Rick reminds Shane early on about a trip his family took to the Grand Canyon. Such a red-blooded all-American place to visit on a family vacation. We’re not suggesting that the Grand Canyon isn’t beautiful to behold, or that it isn’t a vital landmark. But of all the places a family could drive to, that one seems boring compared to Universal Studios or Six Flags. In hindsight, it’s a good thing Rick took the Grimes family there when he did. Fans of other zombie shows may recall that the Grand Canyon doesn’t fare so well in other apocalyptic settings. On Z-Nation, the survivor group comes upon a “Zombnado”. Yes, a large weather anomaly that is many miles wide and chock-full of what they sometimes call “puppies and kittens.” It should be noted though that Roberta Warren and her people don’t shy away from the Z-word like they do down south. The Z-Nation team deals with the Zombnado by leading it into the Grand Canyon, filling it nearly to the top with the squirming undead. Not the panoramic photo most of us think of when someone mentions the Grand Canyon. Did you know that Andrew Lincoln, the actor who portrays Rick Grimes, doesn’t use his given name professionally? His birth name is Andrew James Clutterbuck. He’s British, so we can probably assume that’s short for Most Noble House of Clutterbuck on Lightly. It’s not so weird that someone would change their name before going Hollywood, though Clutterbuck is an awesome real-life name for a guy who’s playing a gold badge-wearing cowboy type like Rick Grimes. It probably was less helpful in landing a role in a romance like Love, Actually. What is weird is that Andrew Lincoln does not do technology. He rarely goes online and still has a flip phone. If you want to send him a picture, he says you have to send it to his wife so she can show it to him. When Lincoln was asked about the many “Coral” memes, they had to explain to him what a meme was, and why so many commenters were misspelling Carl’s name. Oh Andrew, you silly luddite! 6. WHO INSPIRES ANDREW LINCOLN? There are three characters that Andrew Lincoln credits as providing inspiration for his performance as Rick Grimes. Once you know them, they seem super obvious. Gary Cooper from the film High Noon makes a ton of sense. Marshall Will Kane is bound by duty, loyal to his wife and his own moral code. Kane risks his life to fight the good fight, even when he has to do it alone. Also on Lincoln’s list of inspirational performances is Viggo Mortensen in The Road. If you’ve seen this one, it might have left you bleary eyed in an existential funk for a day or so. Viggo is tired– more tired than anyone has ever been, and hungry, and thirsty, and alone except for a son he protects with his life. He’s also got quite the scraggly beard on him—a look Rick clearly emulated in later seasons. Lincoln also gained inspiration from Walter White, the lead Breaking Bad character who appeared on AMC, the network that also brings us The Walking Dead. This probably represents the darker side of Rick– quick to kill when necessary, less-than-honest when he has to be, and an all-around badass. We know Rick Grimes as a man committed to fairness and doing what’s right in all things… for a while. Part of that was always getting input from other members of the group. Throughout season two, the main group could always count on Carol thinking about the children first, that Andrea or Shane would concentrate on protection, that Glenn could plan supply runs, that Dale was the group’s conscience, and that Daryl would be out foraging or looking for Sophia. After the Greene farm went up in flames, everything changed. Rick’s long stares into the distance took on new meaning after losing so many people in season two. The group was no longer a democracy. They were, as the internet declared, a “Ricktatorship.” We’ll say what Rick did was more akin to Marshall law. He took command of a situation because he knew he was best equipped to handle it. Within a few weeks, it became clear that Rick couldn’t do and decide everything alone. At the prison, Rick discarded his leadership role and settled in to be a farmer and a dad. Too bad that didn’t last. Casting is a vital part of any TV show. Imagine how Cheers would have been different if they’d cast Ed O’Neil like they originally planned. Frank Darabont had a few different actors in mind when it was time to cast The Walking Dead. First, was Mark Pelligrino, who had pivotal roles in ABC’s LOST and Showtime’s Dexter, among others. Next up was Thomas Jane, one of several actors on The Walking Dead who also appeared in Darabont’s film The Mist. Jane would have been an excellent choice for Rick Grimes. In The Mist, he even had a headstrong little boy who didn’t want to stay in the house. Andrew Lincoln also beat out Jaime Bamber for the role of Grimes. Bamber is best known in the UK for his turn on Law & Order UK, and his incredible performance as Lee Adama on Sci-Fi Channel’s kickass reboot of Battlestar Galactica.Clearly, any one of these men would have done a fine job as Rick. But Andrew Lincoln has totally worked out. Family is a common theme on The Walking Dead. The Grimes family is one of many on the show. The Peltier family has gone through a lot, as have the Joneses, the Greenes, the Dixon brothers, the Andersons, and the Monroes. But not all the members of the main group are related by blood. That hasn’t stopped anyone for forming close bonds with each other, akin to what real-life siblings feel. In season one, Rick calls Shane his brother. It makes sense, they’d been friends since high school. When Shane lost his mind, it seemed like Rick might not be that close to any man again. In season two, Daryl is forced to shoot Dale before he turns. “Sorry, brother” are his last words to Dale. In season three, we see a zombified Merle Dixon. Who mourns Merle? No one… except Daryl. And because we love Daryl, we hate to see him have to put his own zombie brother out of his misery. Maybe a salad would make Daryl feel better. By season four though, Rick tells Daryl that he’s his brother. That feels right, doesn’t it? Rick Grimes’s weapon of choice is the Colt Python .357 Magnum. As it happens, this is a good gun for the zombie apocalypse. It’s uses .357 bullets or .38 special ammo and is accurate up to about 70 yards. In general, it’s best not to end walkers with gunfire. But there will always be situations when one has no choice. The Colt is designed for functionality, not flash—matching Rick’s practical, no-frills nature. The only trouble is that holding a gun with the back-end up, pointing down is… to put it mildly… not the best way. Internet wags have plenty to say about Rick’s dramatic but impractical gun-positioning, but none of those people are currently surrounded by Walkers. In the comic, the Colt Python is one of several guns Rick is seen using. 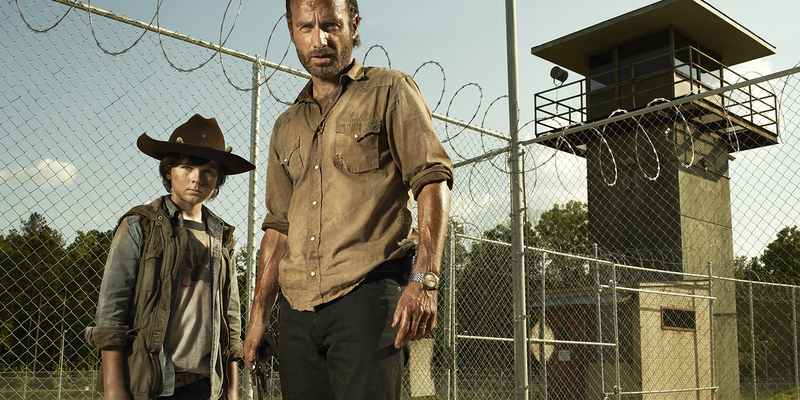 On The Walking Dead, Rick uses it almost exclusively until season five, when he buries it in his secret gun stash. Rick’s Colt is the same gun Daryl uses on Dale Horvath after he’s somehow ripped open by bony zombie fingers. Don’t get us started on that injustice. The thing to remember here is that how someone answers these questions is as important as what their answers are. They’re a test of a person’s honesty, not a judgment based on what someone had to do to stay alive. As we know, by this point many characters have lost count of how many walkers they’ve killed. In some cases, this applies to humans as well. Rick’s been asking these questions since season four. But where did they come from? Rick is asked by one of his season three hallucinations how many people he killed. The hallucination doesn’t ask why, but Rick volunteers an explanation. Nobody would argue that Rick had to kill those first few people. The only thing you have to remember is that if you’re ever asked these three questions, be sure to tell the truth.